About an hour after departing "the North", we were half way between the North and "the South". We knew this because we came across a pub that had both Cascade and Boags on tap. "Why is this? ", we asked the barman. "Because we get people from down South driving here", he said. "The locals drink Boags". This half way house was in fact in Ross, the historic little town just off the so-called Historic Highway between Launceston and Hobart. While some wags say that the towns are called historic because they will be history if tourists don't visit them, the truth is that there was a fair amount of goings on in these old places, and most of the buildings seem to be 19th century. Not much in other parts of the world, but quite something in our young country. Ross itself is quite well preserved. 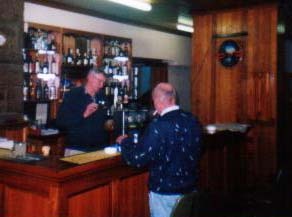 Our focus was on the Man-o-Ross Hotel, which has been serving beers to thirsty travellers between Launceston and Hobart since 1835. 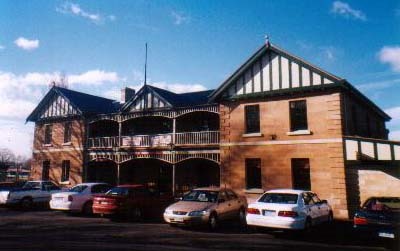 The pub is in the centre of the town, which they say caters for all of man's needs with the pub, court, jail and townhall on each of the corner of the intersection. Thankfully, we were only in need of one service on this day, and the Man-o-Ross provided it. We plopped ourselves down at the bar and started chatting with the owner. He had bought the joint in 1988, and spent some $800,000k doing it up. To have had that sort of cash in the 80s in Tasmania was no mean feat, and we quietly wondered if it was well spent given it was a Sunday some 14 years later and he was pulling us a beer. Just over 5 years ago he had leased the place and gone further north in Tassie to live. He had just started running it again himself a couple of weeks ago. We asked again about the whole North/South Boags division. "Bloody tell me about it", he said with a sigh. "For five bloody years I lived up North in Boags land, and for the life of me I couldn't get used to Boags". "I tried and tried, but no matter what I did it gave me the shits". "I was scared to fart". We nodded knowingly while he continued. "In the end I just had to drink VB, or Cascade, or any bloody thing". "You might think, oh, it just all in the mind, but the boys used to switch my glass every now and then, and boy, did I know about it". Various images flashed before our minds when the bloke next to us ordered a Cascade. "You from down south", we asked. He was, and he knew his beer, giving us a run-down on the old Cascade Red and Cascade Green (which was, according to him, the Pale Ale). "Ah", he said, "the Red was the drink we used to drink". "The Green, mate, it was crook - it was crook." "You could only have a couple". According to him, Cascade only used to lager the Green for a day back then, and that's why it was known as the Green. "Anyway", he said. "I'd best be off before the boys in blue get back on the road". With that, he was on his way. 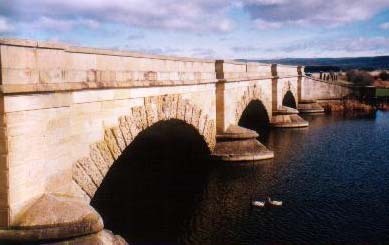 And, we were too, stopping only to examine Ross's famous bridge that was intricately built by convicts in 1836, and engraved by a certain Daniel Herbet who managed to carve his way to a pardon. Having seen enough heritage for one day we ventured deeper into Cascade country with the Boags thankfully sitting quite well. Chat about this on our message board.